The Big Joe joey eStep is the perfect replacement for a rolling ladder. It is a manually propelled unit with powered lift that provides companies with a safe alternative to low level rolling ladders in the workplace. The DC lift motor and twin post hydraulic elevating system on the eStep are capable of lifting an operator up to 42” while remaining in a fully enclosed compartment. When elevating the operator compartment on the eStep, an automatic floor lock deploys improving stability. Locking rear swivel casters are additionally provided for elevated use on smooth surfaces. Simple and intuitive controls include fingertip lift/lower buttons and an emergency power disconnect. Manual movement and positioning is easy even when loaded, thanks to the four large polyurethane caster wheels and high mounted rear push bars. Two large steel load trays on the front of the eStep allow the operator to access multiple items without having to raise and lower repeatedly, and a load platform on the chassis can carry additional materials from location to location. Standard equipment includes a cup holder, a key switch to limit access to approved personnel, and an integral lithium battery & integral 110v smart charger. 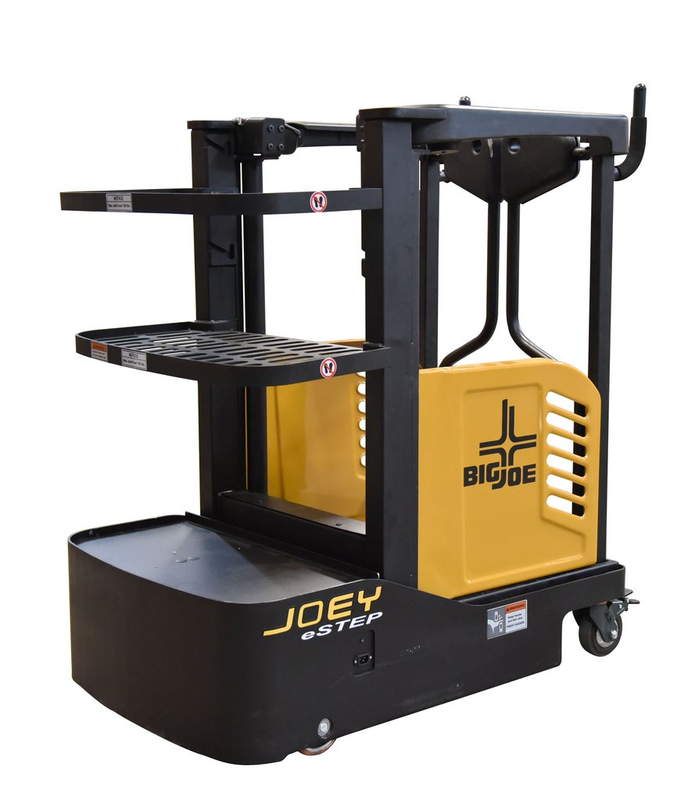 The Big Joe Joey eStep access lift is an economical purchase in the present and future. While this is not as cheap as a rolling ladder, the safety benefit you receive far outweighs the risk of potential accidents and injuries that occur with roller ladders. At a price point well under $10,000, the Joey eStep is a great purchase. The Joey eStep access lift is simple to operate and safe. The eStep is the best alternative to a rolling ladder. A person manually stepping up and down a rolling ladder in a store or warehouse causes severe safety concerns, while the Joey access lift safely lifts you to the required height. The Joey eStep access lift comes with a lithium ion battery and charges by being plugged into a 110VAC wall outlet. With being maintenance free, there is no need to water the batteries or question of how to charge them. Simply plug the cord into the wall and you are charging! What application do I use the Joey eStep access lift in? 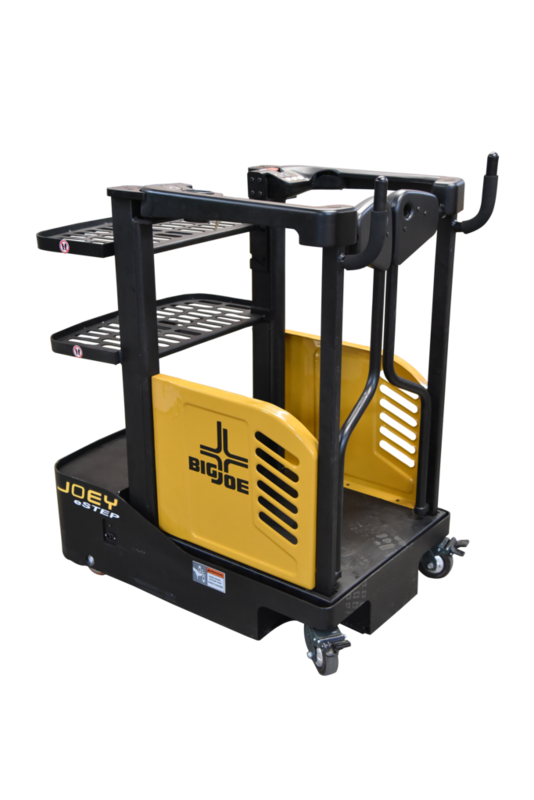 The Big Joe Joey eStep access lift is a great option for maintenance needs in various environments. While the max lifting height is only 42″, this access lift allows the operator to reach heights just out of arms length to complete that specific maintenance task. 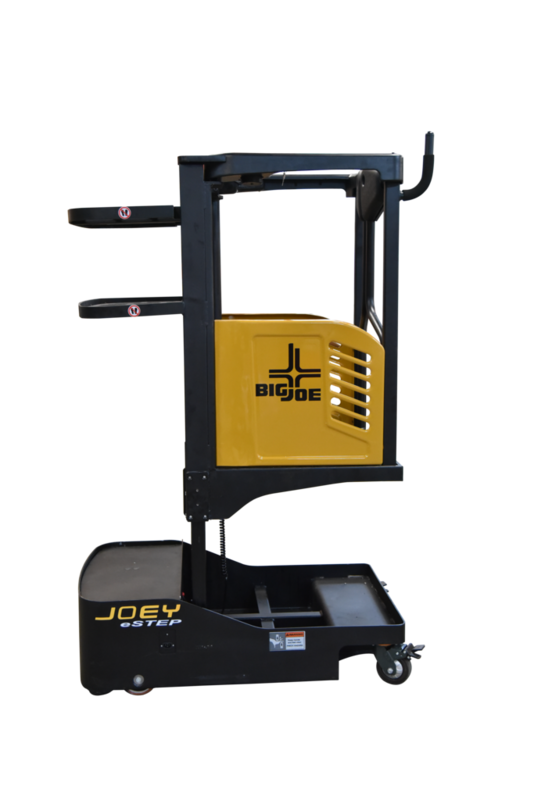 The Big Joe Joey access lift is the safest way to have an operator reach heights for single item picking. The Joey eStep access lift isn’t just for maintenance in a warehouse or manufacturing facility; this could be used in maintenance in an office building or a grocery store. Any type of application where low level rolling ladders are used or single items needs to be reached, the Joey eStep access lift is the best option.